Who would have thought a tobacco barn candle would have smelled so good. I am absolutely in love. I purchased from a local gift shop in Florence, SC. All of the candles sold smelled amazing. I plan to go back and purchase from the same local dealer for Christmas. I myself make soy candles but not to sell. I just usually give them as gifts. Now, I will being giving these as gifts. Gardenia and Rose are next on my list. I love the face that the business is family owned, charitable and uses recycled wine bottles. What a beautiful presentation they make. We ordered these candles for Christmas presents, and everyone LOVED them! The packaging is adorable, and they all smelled AMAZING! Received a pumpkin pie scented candle for Christmas. Very pleased with this scent, throw, and burn time. I researched the company and was impressed with this locally based company. Will definitely buy more candles to enjoy and give as gifts. These are amazing candles. Bought my first one a few weeks ago in Clinton, SC. They all smelled so good but I decided on Gardenia. It is absolutely beautiful, love it! I love even more, buying something made in my home state of South Carolina! Interesting idea. Looks great, smells perfect. Thank you very much. I was born and raised right here in Florence and a South Carolina history buff! I LOVE everything about this candle company. From the recycled bottles, the name of the company, to the logo! And then there's the scent of the candles! Apple Jack and Peel and Citrus are a must in my home. Shop local, buy local! Clean Cotton is the best! worlds...based right in my hometown of Florence, SC, Lisa and her husband, Art, work together to take recycled wine bottles from our great restaurants in Florence and cut them to the correct size, and then fill them with the best fragrances around. I am lucky that I have my own retail store that sells these candles, so I get the pleasure of trying all of the fragrances. They are all great, but my favorite is the Clean Cotton. My wife loves the Coffee fragrance the best though. In truth, I don't think you can go wrong with any of them. I would put these candles up against any of the other candles that I sell in my store. The quality, size, and price can't be beat. Thanks Lisa! I love my candles. I have 2 of the cashmere scents and they are great! A few weeks ago I had someone tell me the room freshener I used was wonderful. The only freshener I had was my Carolina Wren candle and it was not even lit! They are not overwhelming but the fragrance is light and clean. I am planning on giving them as gifts for sure and can't wait to try the other fragrances. I LOVE my Carolina WREN candle! The "clean cotton" is a refreshing beautiful fragrance. It is true to its name and the smell is through and through. It was a lovely gift from a friend and encompasses two of my favorite relaxing elements; wine and candle! My husband and I loved the fragrances available. He chose Lavender & I like the Clean Cotton. The Fireside fragrance brought back memories of our camping days. A great choice for a SC gift basket. We received two Carolina Wren Candles as a gift. We've been enjoying them several times a week. I'm amazed at the craftsmanship, quality and the value for money. They last and last and last. 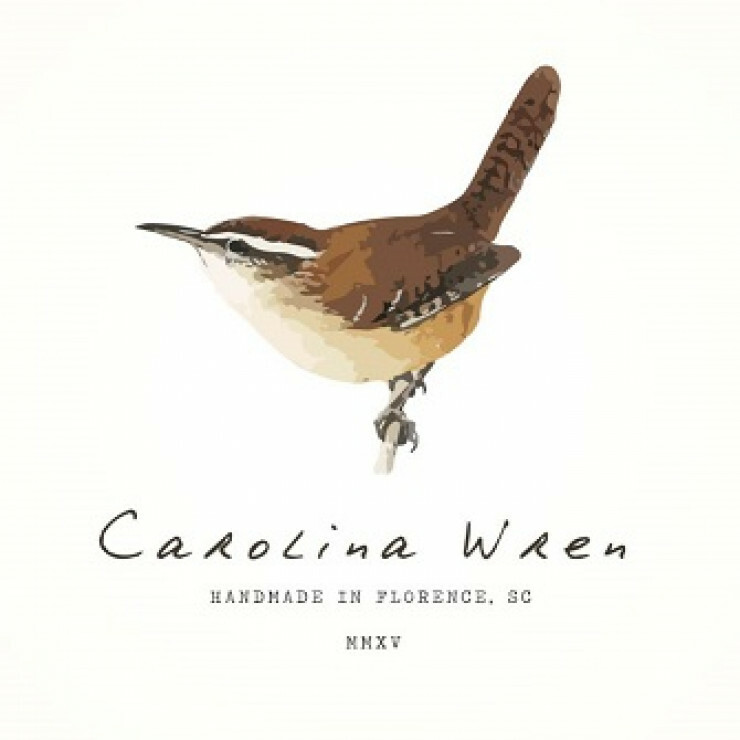 We definitely recommend Carolina Wren and are pleased to know they are a group of people with integrity. I am a candle fanatic, so I am always looking for a great, long-lasting candle to keep in my home and office. I purchased the lavender and clean cotton scents, and absolutely loved them!! The scent is fresh and not overwhelming. The lavender actually makes me feel relaxed, and the clean cotton makes my whole home smell fresh and clean! My husband likes them as well! I am anxious to try out other scents! These also will make fabulous gifts for my "hard to buy for" family and friends. I especially love the SC state bird on the logo for my out of state family members. I am already telling everyone I know about these candles, and I love supporting a local business. Keep up the good work!! !